Introduction: In this article, Scott Phillips writes about his genealogy surprise: he was researching a branch of his family tree and discovered a Confederate captain from the Civil War! Scott is a genealogical historian and owner of Onward To Our Past® genealogy services. One of the most enjoyable aspects of working on our genealogy is the surprises we discover. If you are like me, you have had your fair share of finding something in your family history research that you either weren’t looking for at the time, or were shocked at what you actually did find. Recently that happened to me while I was working on our daughter-in-law’s family branch. Here is that story. And after telling you about my latest genealogy adventure, I’d love to hear about your biggest genealogy surprises! I had been at work on our daughter-in-law’s family tree for some time when I got a bit stumped on one of the female members back in the early 1800s. The family was from southern Ohio and their daughter Mary A. Dillon seemed to have disappeared on me. That is to say, she disappeared until a colleague happened to mention that he thought she might have married a fellow by the name of Scovell. A quick check with the Lawrence County, Ohio, Genealogy Society and I confirmed the marriage of our Mary A. Dillon to one William Tiley Scovell. Once I had a place and a name I was off to the newspaper archives and other databases of GenealogyBank.com to see what else I could find. Well, the last thing I was expecting to find in my family tree was a Civil War Confederate captain who was so in demand that Southern generals were competing to have his services! Plus, none other than General Robert E. Lee, the top man himself, was deciding where Scovell could best serve the Confederacy. I’ve long known that we have a Civil War veteran or two in our family tree, but never anyone above the rank of private and certainly no one who was in demand quite like Captain Scovell. A riverboat captain before the war, Scovell evidently was extremely adept at getting ships, men, and cargo up and down—as well as across—rivers. 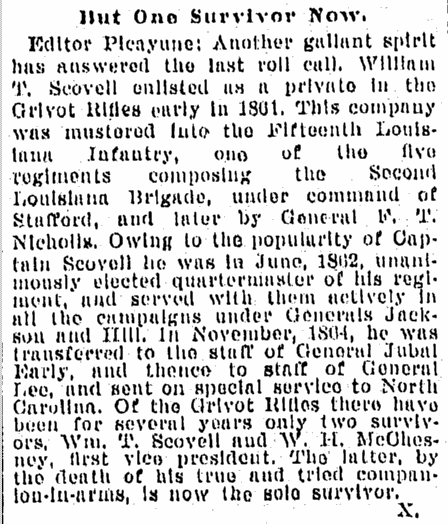 In my first search I found an 1895 newspaper article explaining that Captain Scovell had just passed away—at that time he was the second-to-last surviving member of the Grivot Rifles of the Fifteenth Louisiana Infantry. From this old newspaper article I gained excellent information, leads, and insight into the Civil War career of William T. Scovell and began looking further. 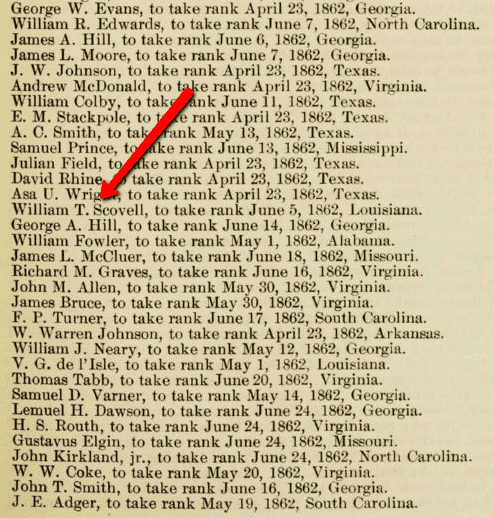 Next I discovered, in GenealogyBank.com’s Historical Documents collection, the Journal of the Congress of the Confederate States of America, 1861-1865, which showed William T. Scovell “taking rank” on June 5, 1862, in Louisiana. U.S. Congressional Serial Set: Journal of the Congress of the Confederate States of America, 1861-1865. Volume II. Serial Set Vol. No. 4611; S.Doc. 234 pt. 2. Next I found an additional 1895 newspaper article about Scovell. 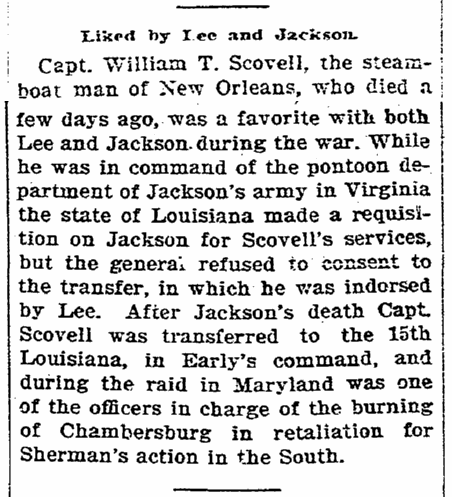 This historical newspaper article was wonderful since it explained that Captain Scovell’s services were argued over by Generals Stonewall Jackson and Early, with the decision over Scovell’s assignment coming from General Robert E. Lee himself. It also offered the information that Captain Scovell was one of the CSA officers in charge of the infamous burning of Chambersburg, Pennsylvania, on July 30, 1864. 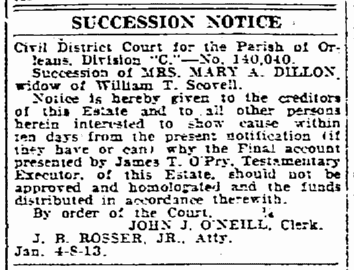 This historical succession notice was for the probate of the estate of Mary. I have since sent to Louisiana for instructions and information on how I can access this will and estate file since the old news article wonderfully contains the court name, parish, division, date, file number, deceased, attorney, and executor. What an abundance of information in one short article! 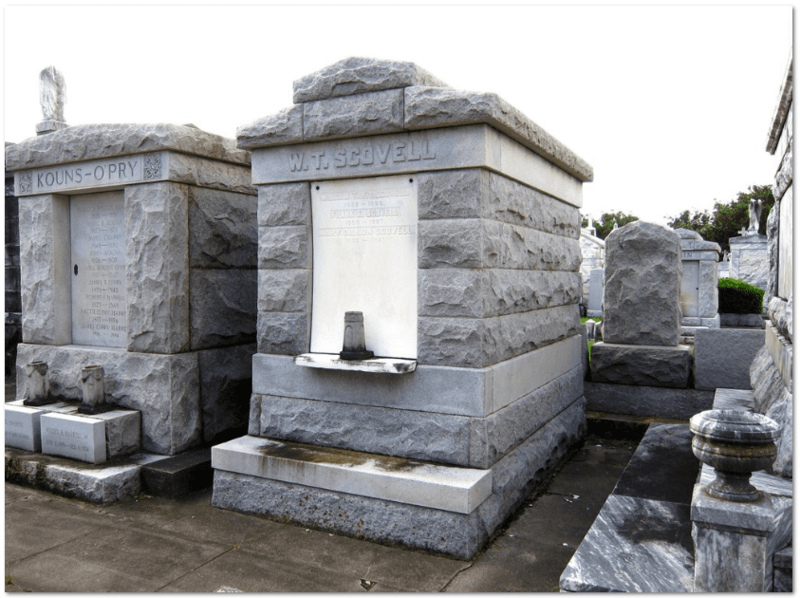 Photo: the Louisiana crypt for William T. Scovell, his wife Mary Dillon, and their family. Credit: from the author’s collection. From almost nothing I am now deeply involved in learning about our family’s Civil War luminary and it brings me back to the question I asked in the beginning of this article. Tell me…what is the biggest surprise that you have found doing your genealogy and family history? I am helping a friend with his family tree and became very curious about his Stokes family who were in and out of Cuba in the late 1800’s and 1900’s. It took a lot of digging and a good deal of luck to learn that his Great x2 Uncle William Stokes was the subject of a book by Enrique Cirules, The Last American. I am waiting not so patiently for my friend to read the book! In my family I had a Great Grandfather that it seems had a sense of humor or was annoyed by a census taker. He gave his name (one census only) as Goincia Gunter. I searched high and low and only found that one record with that name. Through his wife and children I was finally able to find that he was in fact Joshua Gunter who died in a confederate prison of war camp in Point Lookout, Maryland. It was a sad and moving end to my hunt for this great grandfather that I had became fond of, to learn that he died under deplorable conditions as a prisoner. I finally figured out the name that he gave the census worker and believe that perhaps when asked his name his reply was “Go and see ya” LOL, bet it was a yankee! Karen, What a great story, even with the bittersweet ending. You have done some marvelous research there. Sounds like your great granddad had a good sense of humor! I noted your comment regarding Cuba with interest as I have family in my tree who also went to live in Cuba for many years ‘for health reasons’ said the passport, but I am more inclined to think it was a savvy business decision. I’m still working on that angle! Congratulations again on your great work! My biggest surprise was about my great-grandmother. I had been looking for her for over ten years. I found her married to my great-grandfather and that’s all. I went on the usual genealogy websites and still nothing. One day I got on rootsweb.com and searched for her and she was in a Soldiers’ Orphan Home and School list in Pennsylvania. I emailed the orhanage/school and got no response. I went on books.google.com and searched. I got her entire lineage in one book on one page. I then searched for the others in her lines. I found her father in a book on the Civil War. He died when my great-grandmother was 2 and her mother was about 19 or 20. He killed himself with his own musket, suffering from diphtheria, and couldn’t go to the hospital because of overcrowding. The good news is my great-grandmother’s sister was also in the school but to my surprise their mother was in a list as a nurse! When they graduated as “Sixteeners” they married within a few years. Their mother later remarried also. If you can’t find a relative check google books. They also list websites that have the book and sell them so I bought them. I hope you continue to have such great success!